All mamoworld products are available at aescripts + aeplugins. mocha is an award-winning planar tracking software that is bundled with After Effects. MochaImport+ helps you to get the most out of it. Send clips including masks from AE to mocha, create corner pins and stabilized precomps, move layers or masks, stabilize, and more. If you don't know stabilized precomps, yet, you will be surprised how powerful they are. A stabilized precomp is a composition in which the tracked region is not moving anymore. Inside of it, you can do any modification - as if it would be a still image - and all your changes are automatically also applied to the original perspective. No matter whether you just want to relight parts of your clip, remove elements with the clone brush, insert something or do any other kind of retouch work - with stabilized precomps it becomes much easier. Did you ever do a corner pin and after a while you noticed that one corner needs to be moved a few pixels to the side? Normally, this is very tedious: To change the tracking data, you either adjust hundreds of keyframes manually or you go back to mocha, export the tracking data again and start from scratch. But with the expression-driven tracking data you just have a single keyframe and all the movement is represented by an expression. Simply change this one keyframe and the position of all other frames changes automatically. You can also start adding more keyframes and MochaImport+ will automatically tween between your keyframes - fixing inaccurate tracks has never been so easy. Move your After Effects masks and 2D point properties with a mocha track. Since this function is based on corner pin data, it does not only consider position, scale and rotation, but also shear and perspective movement to achieve maximum accuracy. Your screen insert should cast some light on the surrounding background? Just add some color correction with masks around the respective areas and move them with the track. Want a lens flare to move with your track? No problem! And with expression-driven tracking data, you can still move your flare on top of the track easily. If you are more familiar with the masking tools of After Effects than with the ones of mocha, you can do all the masking in After Effects and send the clip including the masks to mocha. This is also useful if you started rotoscoping in After Effects and at some point you decide you rather want to switch to mocha. The Bezier Warp is a corner pin effect with bezier handles on all corners. This allows you create corner pins on curved surfaces, as you can see in our balloon tutorial. With the well documented scripting API you can use all functionality of MochaImport+ in your own scripts. It has never been so easy to integrate mocha in your automated pipelines. 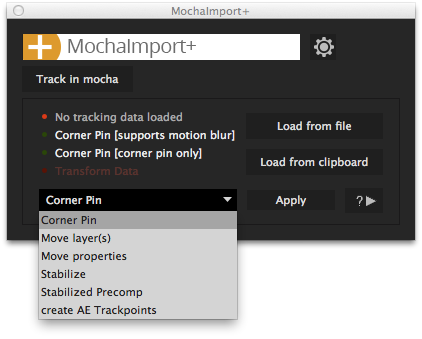 All features of MochaImport+ for After Effects work with any version of mocha. In particular, all features of MochaImport+ can be used with the version of mocha that is included in After Effects. On mamoworld you find plenty of video tutorials about MochaImport+. Should I use MochaImport+ or MaskTracker+? MochaImport+ has a sister product MaskTracker+ which can do similar things, but is based on the mask tracker of After Effect CC instead of mocha. Our experience is that working with MaskTracker+ is usually a bit quicker on simple tracks, since you can do all work inside After Effects and don't need to switch to a separate application. On the other hand, the mocha planar tracking technology gives often better results for challenging tracks that have motion blur or reflections, for example. Also, mocha can easily handle foreground elements, can do multiple tracks simultaneously and supports X-Splines which makes it the tool of choice for bigger tracking and roto jobs. Our tip: Your best choice is the Tracking Bundle which contains both MaskTracker+ and MochaImport+. Then you can do most tracks quick and easy with MaskTracker+ but if the mask tracker gives bad results, you can switch to mocha instead of spending hours to fix your track. MochaImport+ V6 is available for $49.99, the upgrade from any previous version costs $24.99. If you purchased MochaImport+ V5 in June 2018 or later, you get the upgrade for free. 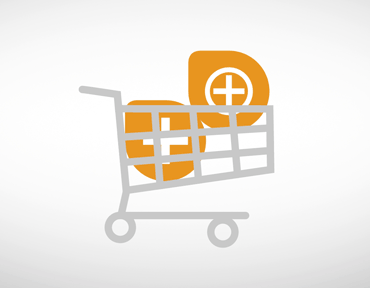 If you login with your aescripts customer account and put the product in your shopping cart, the correct upgrade price for you is automatically calculated. If you enjoy working with MochaImport+, you should also have MaskTracker+ in your tool set. Therefore, we came up with another upgrade deal: If you buy the MochaImport+ Upgrade together with a license of MaskTracker+, you only pay for MaskTracker+ ($49.99) and get the MochaImport+ Upgrade for free. If you neither own MochaImport+ nor MaskTracker+, also check out our Tracking Bundle.